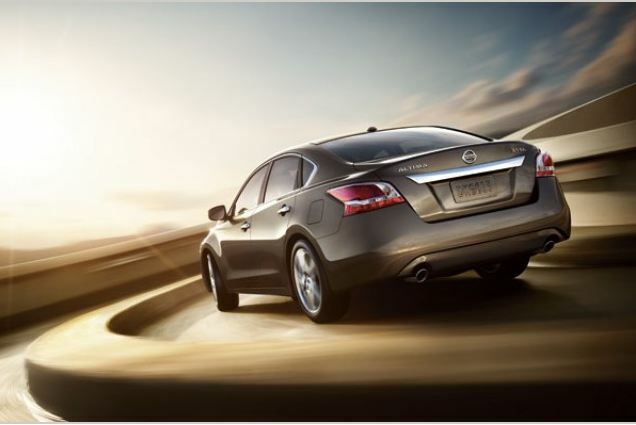 For the 2013 model year, the Nissan Altima has seen a complete design overhaul. Both the exterior and interior have been fully redesigned, while fuel economy, suspension, and steering have also improved tremendously. Luxury seemed to be in the forefront of Nissan’s mind when redesigning the 2013 Altima’s exterior. The Altima’s new exterior look utilizes beautifully sculpted bodylines and an elegant grille to create a posh profile that takes the Altima’s styling up a notch. Consumers even have the option of either a sedan or coupe body style. There are two different engine options for the 2013 Nissan Altima. The first is a 2.5-liter four-cylinder engine that is available on the Altima 2.5 sedan, producing 182 horsepower and 180 lb-ft of torque. This powertrain option is only available with front-wheel-drive and a continuously variable automatic transmission (CVT). The coupe models are also available with this powertrain, though it generates less power with 175 horsepower and 180 lb-ft of torque. A 3.5-liter V6 engine powers the Altima 3.5 models, churning out a healthy 270 horsepower and 251 lb-ft of torque, also with a standard CVT and front-wheel drive. For the 2.5-liter sedan, EPA-estimated fuel economy comes in at 31 mpg combined, while the coupe with this engine is rated a bit lower at 26 combined. The 3.5 models are rated the lowest with 25 combined. In the cabin of the 2013 Nissan Altima, high quality materials and a simple, modern design come together to create a decidedly upscale atmosphere. The gauge cluster is easy to read, with a 4-inch LCD screen that provides the driver with much of the information it needs, while the “zero gravity” front seats provide more comfort than ever before. Though the seats have improved immensely, space within the Altima itself is still average for its class. According to government crash testing, the Altima sedan gets a five out of a possible five star rating for overall crashworthiness. Standard safety features for the Altima include antilock brakes, stability and traction control, front side airbags, and side curtain airbags. Also standard on all sedans, with the exception of the base and S trim levels, is a rearview camera, which is an option on the coupe. Optional on the sedan are blind-spot monitoring, cross-traffic alert, and a lane-departure warning system.